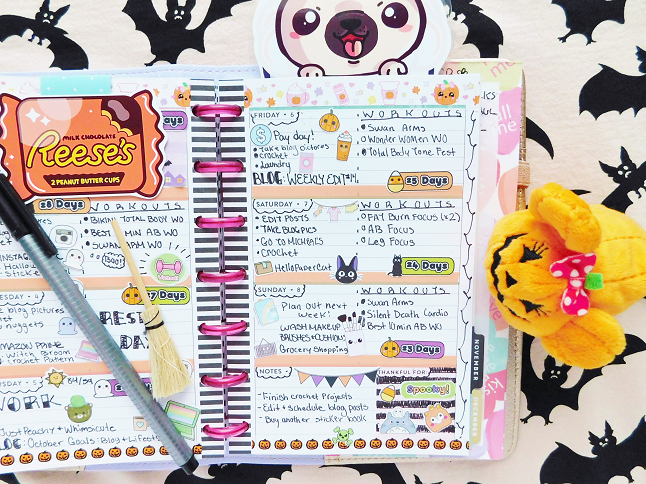 As you can see I am still using my mini MAMBI happy planner I do want a bigger size but I haven't seen the planner I wanted anywhere online or in stores so until it's available I will continue to use this planner or wait until next year to buy a new planner. 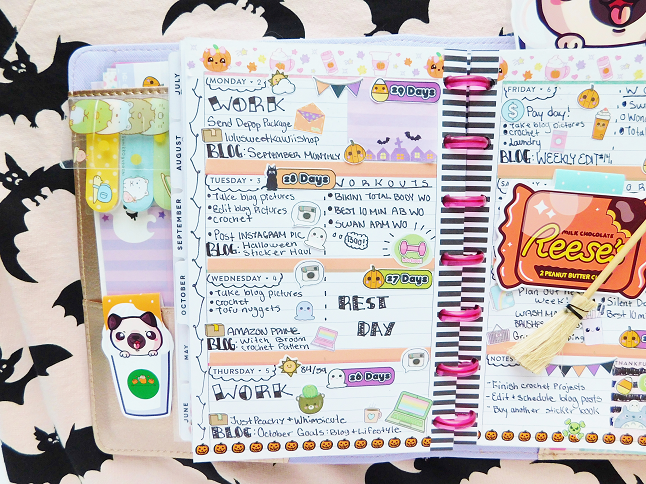 I used the pumpkin spice latte washi tape by Hoshi Island to line the top of my planner and a pumpkin washi tape from Michael's Craft Store to line the bottom of the spread. 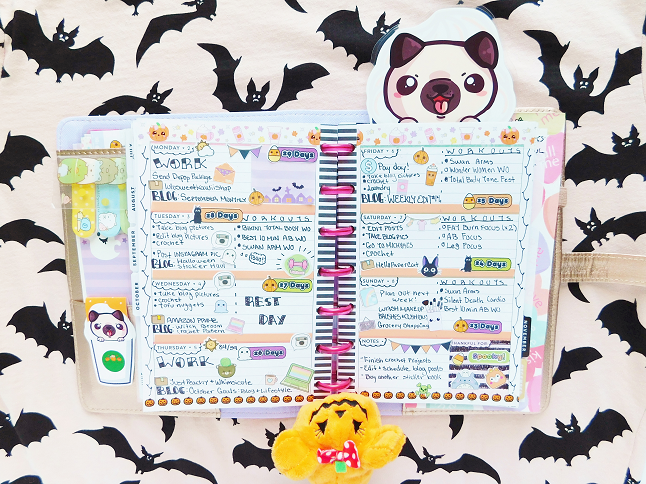 All the stickers are from Sprinkled Pug and most of the planner accessories are from Hello Paper Cat. I divide some of my boxes in half to separate the days that I work out. Writing down and checking off my workouts really motivates me which is why I do it. Ironically this week wasn't the best week to track my workouts because I did miss some days (the first time in 3 weeks too, lol). The Halloween countdown stickers are all over the place because I received them last Saturday but still wanted to include them so I just placed them anywhere that had space available. As for the notes, I never know what to put in that section so I just made a list of things I wanted to get accomplished within the week. 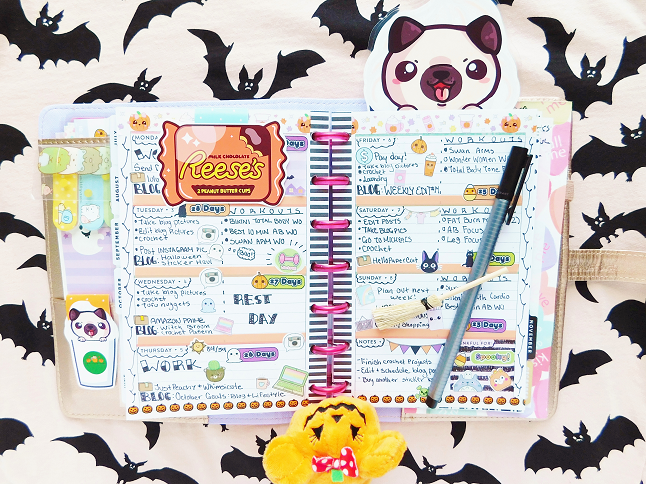 What do you put in your 'notes' section? I still haven't even tried a pumpkin spice flavoured ANYTHING! I'm going to make it my mission to try a pumpkin spice flavoured drink before it disappears for another year.